1. I will always play the game to the best of my ability. 2. I will always play to win, but if I lose, I will not look for an excuse to detract from my opponent’s victory. 3. I will never take an unfair advantage in order to win. 4. I will always abide by the rules of the game—on the diamond as well as in my daily life. 5. I will always conduct myself as a true sportsman—on and off the playing field. 6. I will always strive for the good of the entire team rather than for my own glory. 7. I will never gloat in victory or pity myself in defeat. 8. I will do my utmost to keep myself clean—physically, mentally, and morally. 9. I will always judge a teammate or an opponent as an individual and never on the basis of race or religion. How does your company’s Code of Conduct compare to this? Back in 1916, baseball players where not yet superstars who could write their own ticket. Do your superstars (rather than management) set the conduct norms at your company? Businesses all need a real code of conduct that is held by management to be just as important as the bottom line. This code of conduct needs to become embedded in the corporate culture, if it isn’t already. This is needed because the business that is run entirely on the principle of “shareholder value” will be inherently amoral. Guided by the belief that if they do not do it, someone else will. And this approach is excused because “the invisible hand” makes sure that when everyone operates in this manner, that the collective outcome will be the best. Riskviews reported that Employee Turnover risk was Imminent in 2011. But it hasn’t happened yet. 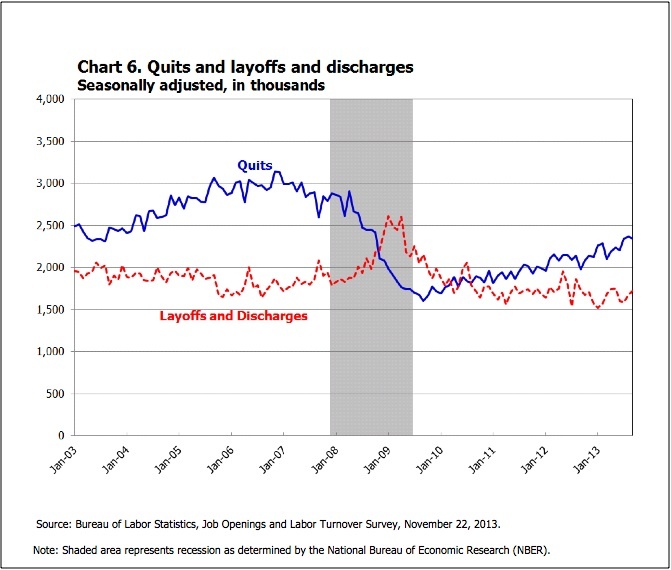 You can see from this recent US BLS chart that employee quits are very slowly edging up, but they haven’t exactly popped. But the points made in 2011 are still valid. A large percentage of employees are somewhat dissatisfied with their jobs and would move given the right opportunity. It is very expensive to replace experienced and highly productive employees. Another factor, retirements of Baby Boomers, will gradually grow over the next twenty years, but will not create any sudden shift in these numbers. The monthly retirements will gradually double, since the baby boomer cohort births were roughly double the annual number of births pre-1946 gradually adding roughly 150,000 to the monthly quit figures. People do not generally all retire as soon as they reach eligibility age, and that practice has slowed slightly since a temporary spike in retirements after the Financial Crisis. Extrapolation of the chart above suggests that it might take another three years for quits to reach the pre-crisis peak. Lesson to learn from the 2011 statement – the statement that something is a risk is NOT a prediction that a loss event is going to happen. Employee turnover is still a risk, but the velocity of emergence has proved to be less than expected. Moody’s says that era is over. Based on Moody’s updated views on US government support and standalone bank considerations, Moody’s lowered by one notch the senior holding company ratings of Morgan Stanley, Goldman Sachs, JPMorgan, and Bank of New York Mellon. Risk appetite setting and its implication on business strategy. Risk appetite is a high-level view of the risks the organization is willing to accept in pursuit of value. When an insurer defines the optimal level of risk, a common view of the ultimate priority is to serve shareholder’s benefits. This will facilitate the decision on the types of risks and magnitudes of the risks to be taken that are consistent with business strategies and market situation. At the same time, the desired risk profile should satisfy the explicit and implicit constraints set by other parties such as regulators, rating agencies, policyholders, debt holders, senior management, and employees. Some external changes have also expedited the process. S&P has required a clear statement of risk appetite as a foundation of “strong” or “excellent” ERM rating. Solvency II also requires insurers to explicitly consider their risk appetite. Risk appetite framework normally includes three levels. It represents the company’s long term target and shall be revised only if there are fundamental changes to the company’s financial profile, market situation and strategic objective. Risk appetite helps prevent default by preserving capital position. This is required by regulators, rating agencies, policyholders, and debtholders. These stakeholders show little or no interest in the upside from risk taking. On the other hand, shareholders are interested in the upside resulted from risk taking and low earnings volatility. Risk appetite for each risk category: Enterprise risk tolerance needs to be allocated to risk appetite for specific risk categories and business activities. For example, selling life insurance policies or underwriting property and casualty risks. Or taking more market risk versus credit risk. By doing this, the company’s resources, like capital, can be allocated to the areas that the company feels comfortable with, or has competitive advantages. When determining or updating risk appetite for different risk categories, in addition to considering the constraints set by enterprise risk tolerance, it should aim to maximize the risk-adjusted return of risk-taking activities. Risk limit: Risk limits are the most granular level which is used for business operation. It translates enterprise risk tolerance and risk appetite for each risk category into risk monitoring measures. The consistency between risk limit and enterprise risk tolerance help the company realize its risk objective and maximize risk adjusted return. Risk appetite not only protects value, but also creates value for the business. It helps senior management make informed decisions to maximize risk adjusted return for the shareholder. Ensuring the consistency between risk appetite and risk limits is very important. Both rating agencies and investors are concerned about whether risk appetite is properly aligned with the risk limits being set for business operation. A sound risk management practice requires risk appetite being integrated into business strategy and corporate culture. 1. Unsystematic description of the company’s willingness to take risk. This could possibly be by an answer to investors, regulators or rating agencies’ inquiry and not fully linked with the company’s ability to take risk. The company has a formal statement of enterprise risk tolerance which has been approved by Board of Directors (BOD). The statement should at least include target credit rating, capital adequacy, earnings volatility, and attitude to operational risk such as reputation risk and legal risk. Risk appetite statement is incorporated in the risk management policy and will be reviewed annually by risk management committee and BOD. When making a strategic decision, the impact is sometimes checked against enterprise risk tolerances to make sure they are not breached. The company has a well established risk appetite framework which includes enterprise risk tolerance, risk appetite for each identified risk category and risk limits. Those are reviewed and approved by BOD and updated at least annually or in market turmoil. The risk appetite framework considers all the constraints the company faces and reflects key stakeholders’ risk preference. They include regulators both at group level and local level, shareholders, debtors, and management. There exists a consistent framework to align risk limits with enterprise risk tolerance. This is essential to make sure all the business decision is made within the company’s tolerance of risk. Integration of risk appetite and strategic planning. Risk appetite framework plays an active role in providing information about risk exposures of business activities and risk reward trade off. Asset allocation and product mix are the two key areas. The whole company is involved in risk appetite framework to facilitate risk identification and foster a healthy risk culture. Risk appetite framework is integrated with all the business decision, including business operation constrained by risk limits and strategic decision to fit into enterprise risk tolerance. Strategic decisions include, but are not limited to strategic asset allocation, tactic asset allocation, new business planning, capital allocation, and risk management strategies. Performance measurement of management is linked to risk adjusted return or risk adjusted value. Effective and company wide education and communication of risk appetite framework are in place and regularly scheduled. Back testing of risk appetite framework is conducted to identify new risks, key assumption errors, and model errors. Risk appetite framework is considered more of strategic risk management than risk limit system. Risk appetite framework puts more efforts on emerging risks or risks hard to identify and quantify. Qualitative analysis becomes critical in corporate strategic decision.